New for 2019! Introducing the All New 50K Relay & 10K Fun Run! A Relay Race designed for teams of up to 5 runners, the perfect opportunity to partner up with friends/family or fellow run club members to race against others teams and possibly earn the title “Fastest Run Club in SoCal.” Also offering a 10K Challenge allowing solo runners a chance to join in on the fun. The second of a four part series planned for 2019. Kick off your spring training right, with us! Taking place at Hahamongna Watershed Park, we’re in for a great morning. Everything from early packet pick up and addresses to finish festival info can be found here. Answers to all your basic questions! The whole package! Check out all the race features and inclusions that come along with your race registration. Distance, elevation profiles, terrain details and more can be found here. Pasadena Running Company & Partners offer a variety of opportunites for you to train and prepare yourself for upcoming races. New to trail running or looking to improve your skills? Check out these articles for tips on maximizing your trail running experience. Didn't find what you're looking for? Additional details & info in our FAQs section. Pasadena Running Co. presents the All New 50K Relay. The second in a series of (4) trail running events in our 2019 Race Series. Designed for teams of up to 5 runners, this is the perfect opportunity to partner up with friends & family and race against other groups in this fan favorite relay race! Hahamongna Watershed Park, nestled in the Foothills of Pasadena and unknown to many local residents offers a variety of interconnected trails, oak woodlands, picnic areas, equestrian riding & disc golf. Within the Angeles National Forest, the Watershed flood basin greatly contributes to the City of Pasadena's water conservation efforts. Race day parking will be FREE and available on-site. Details directions and parking maps will be emailed to registered participants. Keep an eye on your email. Elevation Gain: + 342 ft.
Pasadena Running Company & Partners offer a variety of opportunites for you to train and prepare yourself for upcoming races. Here's a quick list of training runs, local run clubs and groups that can help you get ready for race day! Pasadena Running Company Partner, Run With Us Pasadena offers Weekly Monday Night Training Runs from their store on Lake Ave. Runners can select from (2) different distances each Monday night and often enjoy great raffles and post-run treats. 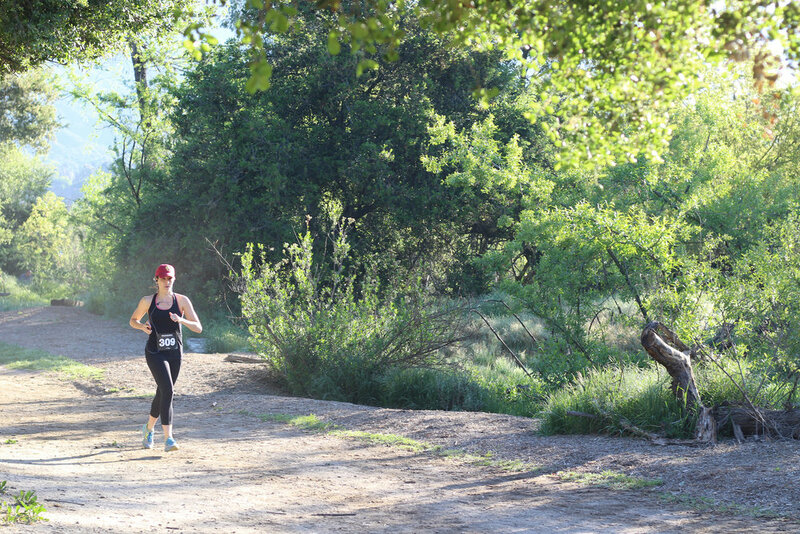 Run With Us also offers rotating Sunday AM Trail Runs stopping at great locations throughout San Gabriel Valley. In addition to being a Pasadena Running Company Partner the Pasadena Pacers is a completely FREE Run Club offering multiple training runs weekly and provide Pacer Leaders offering expert training/advice for runners. Trail-loving Pacer Groups also have rotating trail runs in Griffith Park and Greater Pasadena Area. Check out the Pacer Nation site for additional details & schedules. In addition to being a Pasadena Running Company Contributor the Whittier Pacers is a completely FREE Run Club offering multiple training runs weekly and provide Pacer Leaders offering expert training/advice for runners. Trail-loving Pacer Groups also have rotating trail runs in the Whittier Area. Check out the Pacer Nation site for additional details & schedules. Join Pasadena's 1st social run club that meets every Tuesdays at 6pm at Dog Haus Biergarten (93 E. Green St.) in Old Town Pasadena! Run a 5K and meet new friends at happy hour, post-run. Membership is FREE and you earn incentives at various milestones when you continue to run with us! All levels welcome. Dog Haus Running Club is an affiliate of FFP Running Clubs, a 501c(3) non-profit organization dedicated to promoting a stronger culture of Fitness, Fun, and Philanthropy. New to trail running? Check out this sweet article from Runners World with helpful tips & tricks for you. Looking to take your training and racing to the next level? Read the Expert Trail Guide article below for pro tips and training options. The event will take place rain or shine! We do not offer refunds or deferrals due to weather. In case of flooding, routes may be altered. I registered, and can no longer attend, can I have a refund? Unfortunately, there are no refunds offered due to injury, pregnancy, business trips, illnesses, or any other reason. However, we will miss you! To accommodate, we will allow you to transfer your bib to another participant. Transfers will not be accepted within 10 days of the event. Yes! To avoid lines, we recommend picking up at Early Packet Pick Up. But, race day pick up is available, please arrive at least 30 minutes before your race start time. Yes! Each event in the series is professionally timed by Clear Timing. Visit Pasadena Running Co. after the race for official results. I’m slow, do the races have time limits? Each distance does have a time limit. However, the limits are all achievable by a standard walker. As long as you don’t stop to read a book under the shade of a tree, we will have a medal waiting for you at the finish line! Limited photos will be available post-race free of charge. Stay tuned for details, and be sure to wear your bib on the front of your shirt! Each distance will be marked on the ground with arrows made of flour! Additional signage will be posted throughout the courses. Before the run, visit the Registration Booth to see a sample of the course arrow. Yes! Each distance will have at least one aid station. Aid stations will all feature water, and electrolyte. Longer distance courses will feature a variety of CLIF products. All participants running over 5 miles are required to carry hydration with them. Hydration options include handheld water bottles and hydration back packs. Check out the inventory at Run With Us! View the tab above, all volunteers have the opportunity to receive a complimentary entry to a future Pasadena Running Company event.